The Aaron Family JCC’s Zale Auditorium turned into a land of magic Sunday, and the magicians — Jill Bach, Helen Gardner and Julie Shrell — and their 300-plus assistants’ main trick? To raise awareness and funds to fight ovarian cancer. 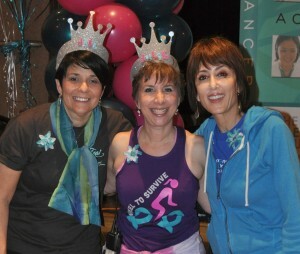 With a reported $282,660 raised, the 2012 Ovarian Cycle Dallas Ride to Change the Future will be one tough act to follow. Bach, Gardner and Shrell co-chaired the event. Ovarian Cycle, the Clearity Foundation and the Ovarian Cancer Research Fund (OCRF) were beneficiaries of the local inaugural race. The JCC’s Zale auditorium provided the backdrop for the roomful of riders on pink, blue and silver balloon bedecked bicycles, most decorated by each team. Team members were dressed in t-shirts, tie-dye outfits, tutus and more. The Pap Shmears, Pedaling for Progress and Team Not My Ovaries were just some of the fun names working to raise funds for the serious cause. On the stage sat an empty bicycle, with balloons in memory of lost loved ones. Ovarian Cycle was founded in 2004 in Atlanta by Bethany Diamond after the loss of her friend, Debbie Greene Flamm. Diamond’s mission then, as it is eight years later, is to fund research to find a reliable screening test for ovarian cancer. 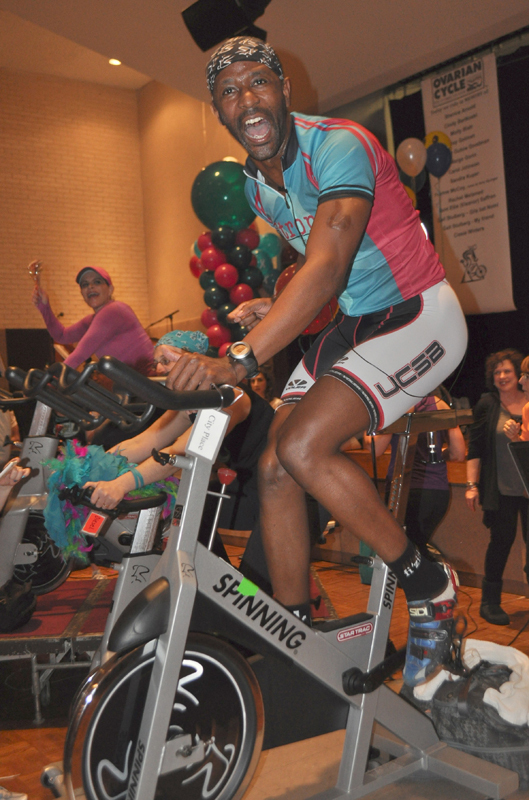 Since 2004, monies raised through rides in Atlanta, Birmingham, Tallahassee, Seattle and New York City have allowed the non-profit organization to donate a minimum of 80 percent of the money it raises to medical research to find an early detection test for ovarian cancer. Each year in the United States, more than 21,000 women are diagnosed with ovarian cancer and about 15,000 women die of the disease. 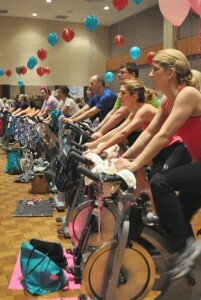 Ovarian Cycle, to date, has raised more than $1 million. The Clearity Foundation, a group of scientists, physicians and volunteers, was founded after Dr. Laura Shawver was diagnosed with ovarian cancer in 2006, learning first-hand that treatment options are extremely limited. “Helen Gardner found our organization and, after tumor blueprinting, determined that she and I had the same diagnosis of clear cell cancer, just two years apart,” said Shawver. The international Clearity Foundation provides doctors access to molecular profiling for their ovarian cancer patients, as well as offering clinical trial options and access to novel therapeutics. OCRF program grants in the past have gone to research such as Joanna Burdette’s study “Identifying Early Events in Ovarian Cancer Using a 3-D Model of Ovarian Tissues” at the University of Illinois, Chicago, and Sharmistha Sarkar’s “Finding a Marker to Detect Early Stage Ovarian Cancer Study” at M.D. Anderson Cancer Institute (previously at the Dana Farber Cancer Institute). According to Katie Dillon, OCRF’s director of events, 2012 grants will be determined later this year, after all the Ovarian Cycles have been completed. Amy Lester and Mark Elfenbein emceed the event that featured messages and encouragement from The Breast Center at the Medical Center of Plano’s Beth Anglin, M.D. ; Texas Oncology’s James Strauss, M.D. ; and Dell’s Entrepreneur in Residence, Ingrid Vanderveldt. Jon Mize, director of Fitness and Wellness at the J, coordinated a team of trainers who, since October, have donated their expertise during training sessions over the last four months, with more intense rides in the six weeks leading up to the event. 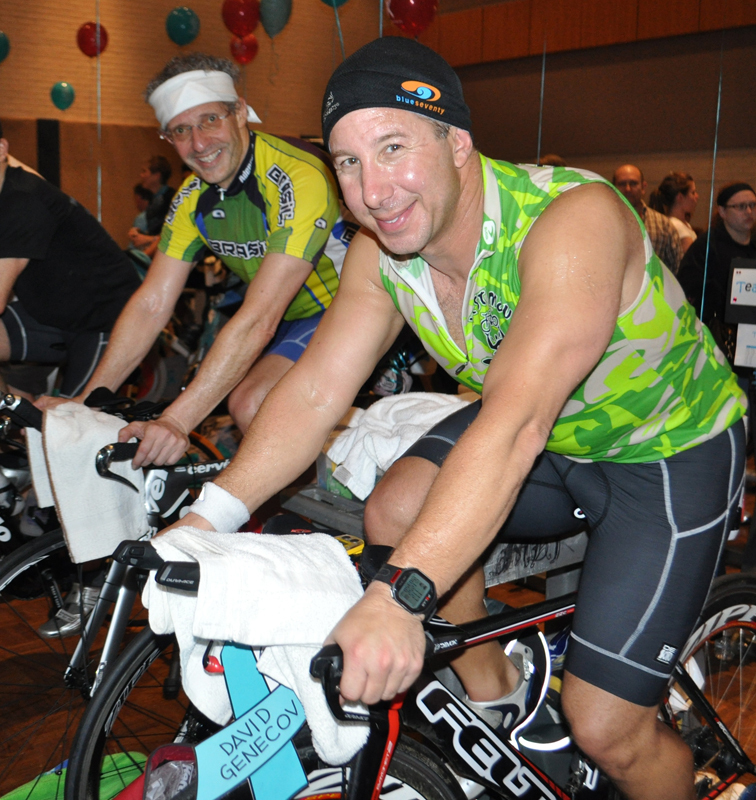 The JCC’s Group Exercise Director, Terri Arends along with Heather Dixon, Bob Grossman, Howard Ketelson, Jill Mearns, Kara Schull, Richard Wharton, Ben Williams, and Dorothy Zarbo, worked with first-time riders and those who’ve ridden the distance. Donations to each team’s website can be made at ovariancycledallas.org through Aug. 31, 2012 (the end of the fiscal year). For more information, email ovariancycledallas@gmail.com. Jack Baum (left) and Dr. David Genecov, brother of Julie Shrell. 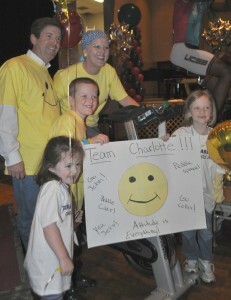 Charlotte Huthnance, top right, is shown here with part of “Team Charlotte,” which included Georgeann, husband Rob, Thompson and C.C. Trainer Ben Williams helped bikers prepare for the event over the past four months. I am the mother of Debbie Flamm a great memorian dor Ovarian Cycle You girls did a great job in Dallas I pray for you all Keep up good work.Her friends Ellen and Bethany continue to work so hard and now Debbies daughter Stacey Flamm works hard.